Chevrolet Matiz 1.0 SE, 2007 (57-Reg), Hatchback, 5 Door. Just Been Serviced, Only Covered 59,500 Miles, Long Mot, Lovely Low Miles, Drives Lovely, Ideal First Car, Comes With 3 Months Warranty, Last Serviced On 05/02/2019 @ 59,407 Miles, Next MOT Due 22/06/2019. Clean Bodywork, Interior In Clean Condition, Tyre Condition Good. It Also Benefits From: Adjustable Steering Column/Wheel, Air Bag Driver, Air Bag Passenger, Anti-Lock Brakes, Body Colored Bumpers, Head Restraints, Immobiliser, In Car Entertainment (Radio/CD), Mirrors External, Paint Metallic, Seat - ISOFIX Anchorage Point (Two Seats - Rear), Seat Belt Pre-Tensioners, Seat Height Adjustment, Upholstery Cloth, Front Fog Lights, 3x3 Point Rear Seat Belts, Folding Rear Seats, Remote Central Locking, Power Steering, Electric Windows, 5 Seats, Blue. 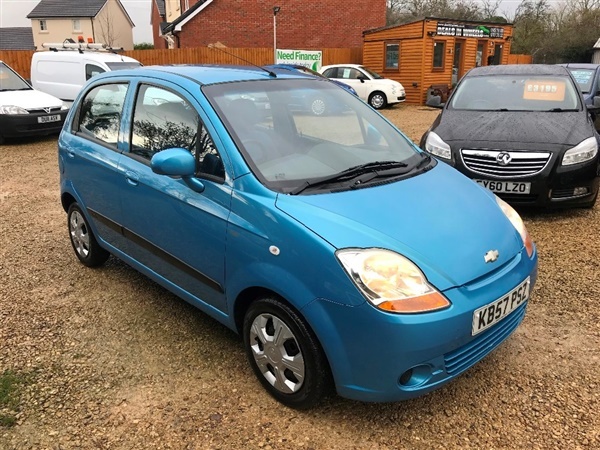 This advert is for a Chevrolet Matiz, click Chevrolet Matiz in Gloucester to see more cars like this in the local area. Want to search further afield? Click Chevrolet Matiz in Gloucestershire to search for similar cars in the wider Gloucestershire area.